THE late international music icon, Dr Oliver Mtukudzi, was yesterday declared a national hero, becoming Zimbabwe’s first musician to be accorded such status. President Mnangagwa announced Dr Mtukudzi’s hero status at the superstar’s home in Norton yesterday. Dr Mtukudzi died at the Avenues Clinic on Wednesday after battling diabetes for some time. He was 66. “The Namibian President (Hage Geingob) called me today and asked if it was true that he had died. He expressed his shock at his death and expressed his deepest and sincere condolences,” said President Mnangagwa. “That is how influential he had become. So, as we sat as the leadership we asked ourselves, ‘If he had such global reach what kind of honour can we accord him since he was one of our own?’ So, as the Politburo we agreed unanimously that he be given the highest honour. Everyone was agreeable. To Amai Mtukudzi, I want to say on behalf of our party Zanu-PF, Government and myself as President and on behalf of all Zimbabweans that we have agreed that he be declared a national hero”. The announcement was greeted with applause and jubilation by the hundreds of mourners who had thronged the late icon’s home to pay their last respects. “Even if we’ve declared him a national hero, we don’t have the authority over the Mtukudzi family. They shall tell us the date when Tuku will be buried. Where I’m from there’s a difference between kuviga, nekurasha, nekuchengeta. Kwedu, chakaipa chinorashiwa, chisingadiwi chinovigwa, chakanaka chinochengetwa. Saka shoko rekuti tichavachengeta rinhi, tinorisiira kumhuri. “There is Cde Muchinguri-Kashiri, our chairperson who shall sit down with the family and they will agree on the burial date,” said President Mnangagwa. He said thereafter the nation would be informed of the programme. Before declaring Tuku a national hero, President Mnangagwa said the Minister of Youth, Sport, Arts and Recreation, Kirsty Coventry, approached him to ask how government can honour a hero like Mtukudzi. “Today (yesterday) Kirsty Coventry visited me and said President I don’t know if what I’m about to say is out of order. I asked her to say her mind. She said, she and Mtukudzi had a lot of programmes in the pipeline and he was a person she held in the highest regard. She said I don’t know whether I am not following protocol, but isn’t there something that you can do to honour Mtukudzi. She said we in the arts we’ll see what we can do also. I said to her, you are on the right track as what you’ve been thinking about are the thoughts of many,” said President Mnangagwa. The President told the gathering that he knew Dr Mtukudzi personally and that the nation had been robbed of an arts and music legend. “The nation has been robbed of a hero and I want to say to the Mtukudzi family that the whole country is mourning with you. “Death affects all of us irrespective of one’s physical or social standing: it is God’s plan and no one knows when their time will come,” he said. The President said it was important that people repent and accept Jesus Christ as their saviour. “It is only God who knows the plans he has for us, so the only thing we can do is to take Jesus Christ as our personal saviour to prepare for our lives after death. There are some who think they are healthy and keep postponing giving their lives to Christ but they don’t know what God’s plan is,” said President Mnangagwa in a mini sermon. He said Dr Mtukudzi was no longer a Mashonaland Central son but belonged to the whole of Africa and beyond. President Mnangagwa urged the relatives of the national hero to take care of the family left behind. “I call on the relatives here not to focus on what you will get from what has been left behind. We don’t want that devilish spirit. Rather, ask yourself what you can do for the family that (Mtukudzi) left behind,” added President Mnangagwa. 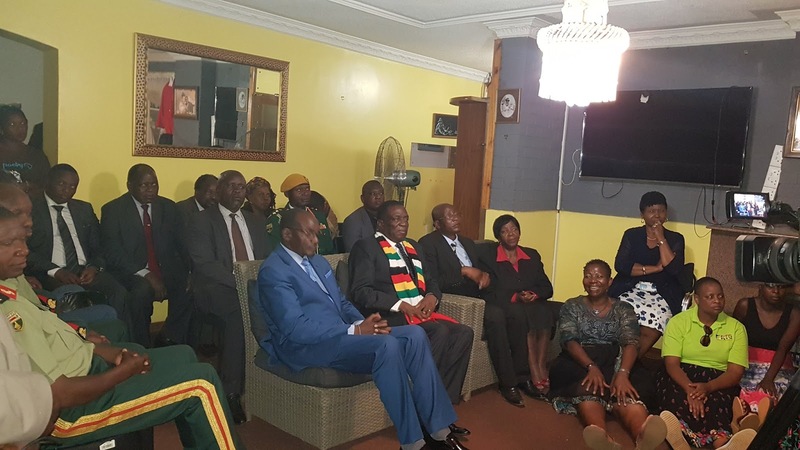 The President was accompanied by the First Lady, Amai Auxillia Mnangagwa; Vice President Kembo Mohadi; Mrs Marry Chiwenga; Defence and War Veterans Affairs Minister Oppah Muchinguri; Information, Media and Broadcasting Services Minister, Monica Mutsvangwa, service chiefs and other senior Government and Zanu PF officials. Meanwhile, regional leaders and the international community have joined the nation in mourning the late Dr Mtukudzi, through a series of condolence messages. As the news trickled through that Tuku was no more, South African President Cyril Ramaphosa also conveyed his condolences saying he was Tuku’s number one fan. “Deeply saddened to learn of the passing of music legend & human rights activist Oliver Mtukudzi. He is immortalised through the contribution he made to the arts, with talent that fired up all of Africa. Deepest condolences to his loved ones. From his No. 1 fan in the whole world,” he posted on Twitter. Botswana President Mokgweetsi Masisi said Tuku touched so many lives through his music and philanthropy. Former South Africa President Jacob Zuma also posted on Twitter mourning Tuku. He said his music united people. “I am deeply saddened by the passing of the legend, Oliver Mtukudzi. His music has carried us through some of our darkest and happiest times, it has also united us across borders. I would like to extend my sincere condolences to his family and friends. Zorora murugare, dear Tuku,” he posted. Kenya’s main opposition leader Raila Odinga said he would miss Tuku’s captivating performances. United Kingdom Ambassador to Zimbabwe Melanie Robinson Tweeted her own message of condolence.